Here's what the Rift has to offer. The Rift is built for comfort and prolonged use. It has a ton of padding around your face, adjustable straps that are comfortable, and – most importantly – a small profile. It's the lighter of the two headsets and is more compact, which decreases the strain on your neck and head. It's light weight and firm fit allows you to swivel your head quickly without fear of it falling off your head. It's also easy to put on and take off without wires getting in the way. This has led to some unique games using the Rift as a peripheral rather than as a monitor. 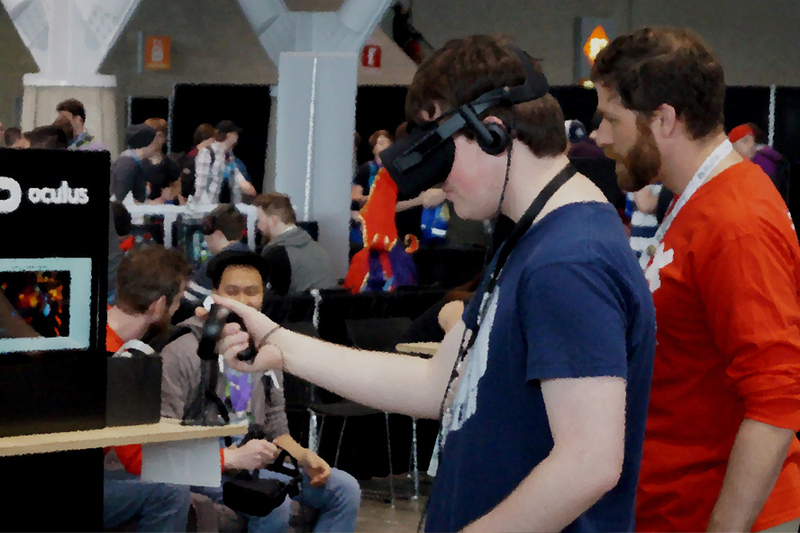 For example, one tech demo allows you to use the Rift as binoculars to zoom in on images that you see on your monitor. Overall, the Rift feels and looks better. It's easily storable, easily movable, and easily playable. After a few hours, you'll forget that it's even there. The Rift has a much more constrained VR space than the Vive, but can be good. First of all, how many people do you know who have a 15 foot by 15 foot room full of nothing but empty space with no couches, coffee tables, or TVs? Heck, even your computer needs to be outside of the Vive's motion detection. Then you have to set up large surround sound speaker-like platforms all around the room to get the Vive to work, not to mention the ceiling has to be high enough for you to swing your arms without hitting anything. In short, you need to make a room for using the Vive and only using the Vive, which not many people have. On the other hand, the Rift's games are designed for a compact space. 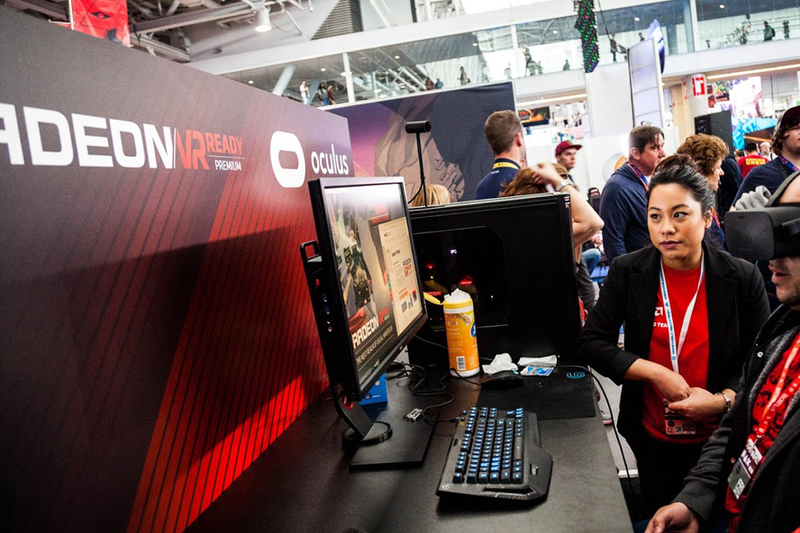 While you might not be virtually swinging swords or diving for baseballs, you will have a full VR-gaming experience in front of the computer you already have, in a room you already have, and at the desk you already have. This is far more appealing to people who live in apartments, shared homes, smaller houses, or have small children and pets. One of the big problems with VR headsets is that they are exceedingly difficult to set up. The Rift, on the other hand, is easy to set up. Plug it in. Put it on. Start a program. You're done. The Rift's firmware will immediately guide you to compatible games with reviews and intensity ratings, which makes it a one stop shop for whatever VR experience you want. The Rift also makes it easy to watch media such as movies, TV shows, and YouTube clips, in VR space. This might not sound like an important feature, but you'll find yourself doing it more than you'd expect. At the end of the day, there are fewer barriers between you and your VR experience with the Rift than with the Vive. 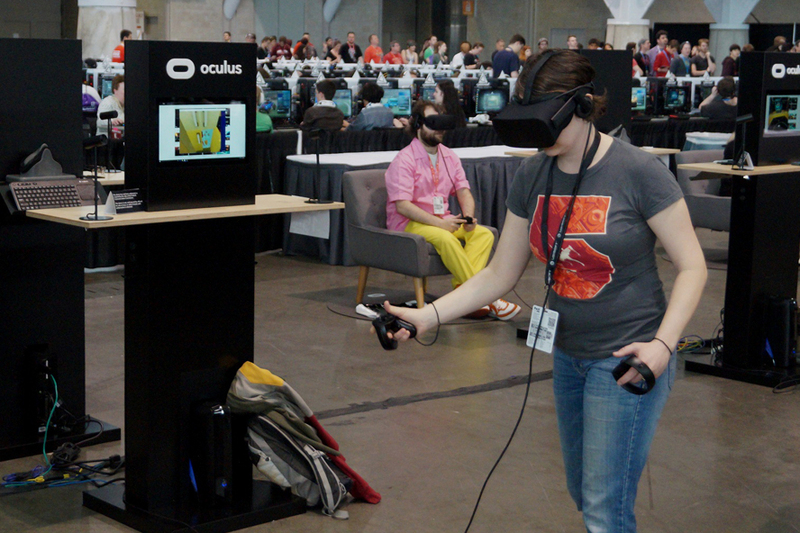 The Oculus Rift's games feel more polished than the Vive's, which feel mostly like tech demos. For example, the Rift has platformers such as Lucky's Tale, space shooters such as Eve: Valkyrie, and RPGs such as Chronos. The Vive has polygonal indie games such as Job Simulator, which are fun and show off the headset's capabilities but can be finished in a few hours. Even the Rift's simpler games such as the so-called "walking simulators," which have polarized the gaming community the past few years, feel like more complete experiences. It's hard to stress how important this is. The Vive still feels a work in progress, while the Rift feels like it could legitimately be the next big gaming platform. 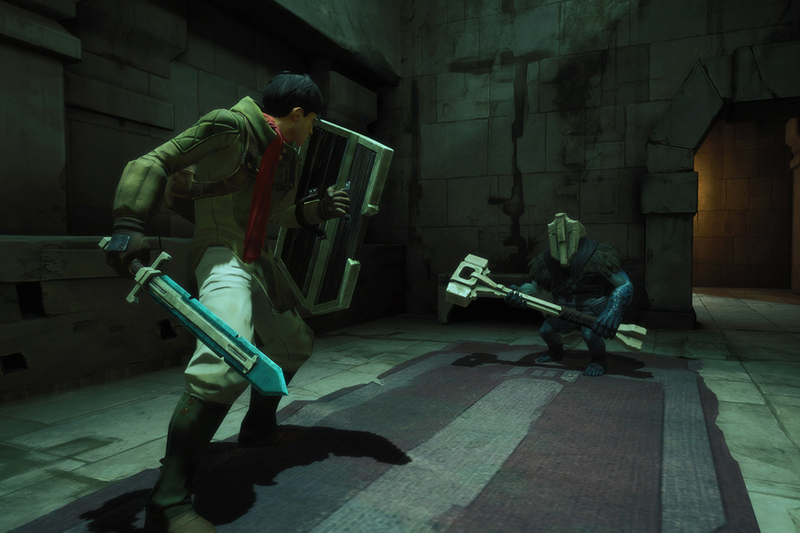 The Rift costs less – a lot less. Yes, it still costs $600, but that's $200 cheaper than the Vive's $800 price-tag. The Rift's lower price point straddles the line between accessible and exclusive. It's a better experience than any of the phone-based VR headsets, but it won't be the most expensive piece of electronics in your home. It is, in essence, a high-end gaming monitor. It hurts the wallet, but it's not an expense with which gamers are unfamiliar. Who Should and Shouldn't Buy the Rift? To be clear, the Vive is the better VR headset when judged by what you can do in the world of VR, which makes it the better buy for VR aficionados. The Rift, however, is the better buy for everyone else. Don't have a big home? You can still use the Rift. Want to watch VR movies? The Rift has you covered. Don't know much about electronics? The Rift will do all the setup for you. Are you a core gamer that cares more about game quality than immersion? Then the Rift is the obvious buy. The Vive is the headset you buy based on future possibilities, but the Rift is the headset you buy based on what it can do now – or at least in August when the back-orders clear up. Why you should choose the HTC Vive Here's what the Vive has to offer.